Join us as we head to the wild new frontier of Cycling! The fringe of Eastern Europe that is opening up to cycle tourism. Experience the iconic Cities of Prague, Vienna, and Budapest, linking them all on picturesque roads, touching the edge of the Austrian Alps. A great challenge with longer days in the saddle making the most of the scenery. This ride blends exploration and fantastic riding into one perfect package! Starting in the beautifully picturesque city of Prague, we have a night to view the iconic bridges, square and spires, before preparing our bikes for the forthcoming ride. As we leave Prague we have a steady but gentle ascending road for the first 2 days tackling the best of what the Southern Czech mountain region has to offer before crossing the border into Austria on day 2. Making our way down the mountain pass and meeting up with the Danube taking us in to Vienna. The Danube is our compass now, as we pass through Slovakia and into Hungary for our final stop before the last big day taking us all the way in to Budapest. An immense trip taking in 4 countries, rolling mountain regions and Europe's most mighty and historic river. The cuisine, countries, landscapes, and fascinating recent history are sure to make this a trip you will never forget. DAY 1: Pre day preparation. Fly from UK to Prague and meet at hotel for evening. Prep bikes and briefing for the challenge ahead. Another uphill trend for most of the morning and crossing the Austrian border. 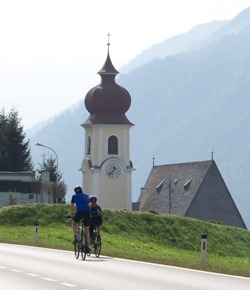 After lunch we have a steady descent for the rest take some nice downhills to make up our timings getting into Vienna. Our flattest day, catching up with the river Danube, chasing it through Austria and crossing into Bratislava, Slovakia before crossing again into Hungary for a night in Gyor. 5 Nights Accommodation is included in your fee. Beginning in Prague, we will be in simple hotels throughout the event (including breakfasts). The standard of accommodation will fluctuate throughout the trip - but is designed to be functional - and to enable us to get a good night's sleep - and continue with the challenge. You will be sharing in twins or triples. If you require a single room then please request this at time of booking (a small supplement will be payable). Upgrades are also available for an extra charge if required. Transfers to/from Czech and Hungarian selected airport. Bed and Breakfast accommodation en-route. 5 lunches, snacks and water on route each day. Flights from and return to UK airport.